Never drive faster than your guardian angel can fly. This angel rides along with you so there is no need for worrying about her catching up. Made from a beautiful cat's eye bead (you choose the color) with a Sterling Silver head and leadfree pewter wings and halo, she measures only 1.5-inches not including keyring. Put her with your keys or hang her from your mirror, you decide where she should be. If no color choice appears in the buyers comments one will be selected at random for you. 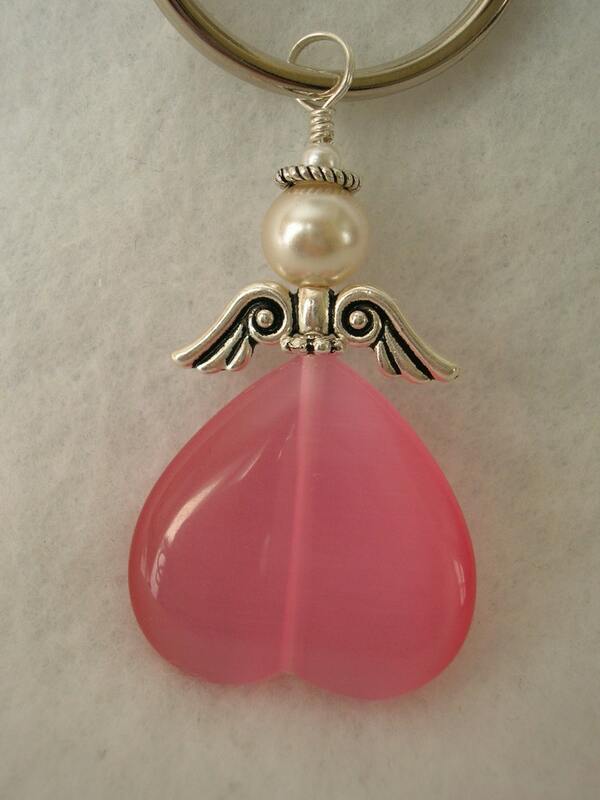 Beautiful angel for my granddaughter's keychain as she learns to drive!!! Mine is a light purple...very pretty. I'll be back for the other granddaughter's angel. Thank you for quick shipping. This angel is so pretty, looks better than the picture! I got two, one for me and one for a friend. I'm so pleased with my bracelet and necklace! The bracelet is exactly what I envisioned and all I did was tell her what I thought about. She did it! Perfect and easy to communicate with. Will definitely remember this store for future mommy gifts!